I’m in the middle of Minimal February, a game I’m playing with some friends on Facebook. We’ve taken inspiration from The Minimalism Game, and are goading one another on to get rid of 406 unused items from our homes during the month of February. On Day 1 we each get rid of one thing, on Day 2, two, and so on until Day 28 when we will dispose of 28 items. By the end of the month we should have ditched, recycled, given away or sold 406 items. It’s an interesting exercise, and strangely addictive. Now that that we’re in the middle of the month I’m having to make fast decisions about what I really want to keep. What do I need? What do I want? What brings me joy? What weighs me down? For a lifelong hoarder it’s like an extreme sport. I’ve talked before about the importance of the pruning process for the artist when blogging about Help Yourself, the Fringe show we performed last year, and plan to revive and revise for the the 2015 Fringe, but this time I’ve been reflecting on why we feel the need to hold on to so much stuff. Some reasons are obvious – sentimental value, the idea that something might come in handy one day, sheer paralysis at the thought of having to decide whether to keep something – but others are less so – a fear that without our stuff we might lose our identity, a peacock-like desire to shape how others view us by what we display. And most of the time we don’t even realise we’re doing it. In the west we are fed the idea from an early age that what we own defines us. Creating and cultivating a personal brand is an ongoing process that many of us do instinctively. The types of books I hang onto “just in case” define the type of reader I want to be (or want others to think I am even though I’ve never got past page 10). The objects I choose to display for “sentimental value” speak of my memories, my relationships, my adventurous past (even though some of my stories may be exaggerated for effect). 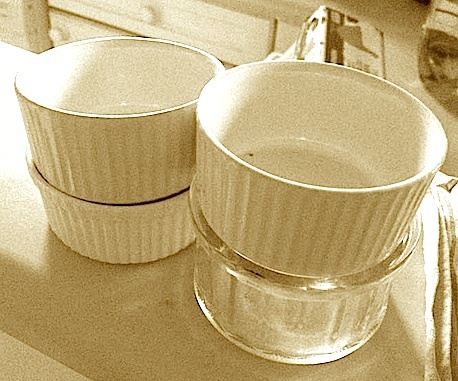 Even the idea of holding onto things in order to use them someday speak of the image I choose to present of myself as a creative, thrifty, imaginative soul (even though it’s highly unlikely that I will ever write a play about old ramekin dishes, a broken knife and a box of old make-up). I’ve been reading Mike Breen’s book Multiplying Missional Leaders in which he talks about the way the church has been shaped by the rampant consumerism of the West, and the USA in particular. Breen’s contention is that the pioneer spirit of the early settlers for whom the vast amounts of unclaimed land were a mark of freedom from the old ways of religious restriction back in the old world. Democratic rights, a constitutional right to the pursuit of happiness and the liberty to practise belief as they saw fit had a darker side, as the right to bear arms, the relentless striving of the American dream and the all you can eat buffet testify. Breen’s contention is that the underlying cultural mores of appetite, approval and ambition have influenced what church looks like in this community. And in ours. All good and well, but what does it have to do with me decluttering? Well, it seems to this foolish thinker that just as I choose to shape my image and brand through my belongings, so my life reveals the underlying appetites, approval-seeking and ambitions of my heart. Clearing out your bookshelves and getting rid of old clothes may not seem like a very spiritual act, but what if it’s done with the intention of creating a brand that is less about me and more about Him? What if I choose to ditch my carefully constructed post-everything image and instead make every effort to live as Jesus did – unhindered by stuff, unexpectedly open to connecting with people and listening for what God wants to do? It’s a challenge, and it will probably take longer than 28 days to accomplish. A few friends have told me that when playing the Minimalist Game I should aim to keep whatever gives me joy. That’s helpful, and it’s a reminder that there is nothing wrong with lovely things – it’s about the value we place on them. The deeper question for me, though, is how to figure out what gives Him joy. And whether I have the courage to live an unfettered life in the confidence that my identity is not found in the stuff. It’s a question of where your treasure is. Because, as a wise man once said: where your treasure is, there your heart will be also. ← Are you tired of sleeping alone, Admin?